2006: 10 Things You Might Not Know About CASINO ROYALE | Warped Factor - Words in the Key of Geek. 1. Although it was the first James Bond novel written by Ian Fleming, Casino Royale ended up being the last of his books to be adapted for the official series of 007 movies (it had previously been produced as a 1954 television episode and a 1967 satirical film). This was because Eon Productions did not own the rights to Casino Royale until 1999 when Sony Pictures Entertainment exchanged them for Metro-Goldwyn-Mayer's rights to Spider-Man. "Casino Royale was not going to be the next film. The script being developed was an original story in which James Bond isn’t the character we know today but someone younger and more screwed up." "I went to them and asked about making "Casino Royale," which is the first Ian Fleming book. I had hooked up with Quentin Tarantino, who wanted to direct the movie. On the fifth apple martini one evening, he mentioned "Casino Royale," which is the blueprint for the psyche of Bond, and I took that idea to the Broccoli family, who produce the Bond movies." 2. 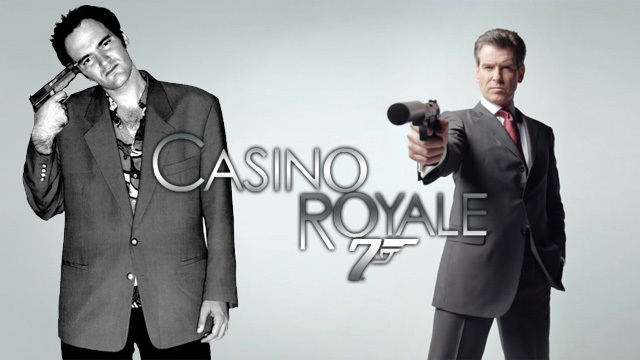 It seems that, at least briefly, Eon had considered producing Casino Royale with Brosnan as Bond. Although he had completed his four movie contract with Die Another Day, he was still "under option" with Eon, meaning that if the studio wanted him to be Bond a fifth time he would do it. In early 2004 Neal Purvis and Robert Wade were tasked with writing a screenplay adaptation of Casino Royale with Brosnan in mind. Their aim was to bring back the flavour of Ian Fleming's original Bond novels. Not long into development it was decided to really go back to the beginning, essentially rebooting the franchise with a young Bond just starting out, and so 50 year old Brosnan was told his services would not be required. "If I don't get the part, I won't think it's because I'm black.... I really want to be Bond. I know the British public is behind me." "I met the producers for a final audition. They told me to expect a decision in a couple of months and they said it was between me and one other person. It's going to be a very nervous wait." The other contender, of course, was Daniel Craig. He was offered the role of Bond but rejected the part as he had felt the series had settled into a standard formula. It wasn't until Barbara Broccoli delivered him a copy of the finished Casino Royale script that Craig changed his mind. Craig boarded a Royal Marines Rigid Raider from HMS Belfast before travelling down the River Thames to HMS President where he was introduced to the world's press. Significant controversy and a very vocal backlash from both fans and press immediately followed the announcement, with many expressing doubt the producers had made the right choice because Craig, unlike previous actors, was not considered by many to be the tall, dark, handsome and charismatic image of Bond to which viewers had been accustomed to. Internet campaigns sprung up, one offering a template letter you could print out, sign and then send to Eon Productions to complain about them deciding "to replace Pierce Brosnan with such an unknown and unattractive actor". Forums were filled with fans expressing their dissatisfaction and many threatened to boycott the film in protest. The day after the announcement the tabloids declared Craig to be "too short", "too ugly", "too young" and "too blonde" to play the part. Many publications ran with the nickname "James Blonde" to accompany their articles, with The Daily Mirror going as far as printing a front page news story critical of Craig, with the headline "The Name's Bland – James Bland". 5. For the coveted role of Bond girl, before Eva Green was offered the role of Vesper Lynd, casting director Debbie McWilliams acknowledged that Hollywood actresses Angelina Jolie and Charlize Theron were "strongly considered" for the part, and that Belgian actress Cécile de France had also auditioned, but her English accent "wasn't up to scratch." French actress Audrey Tautou was also in contention, but her commitment to The Da Vinci Code forced her to withdraw herself from consideration. 6. The Aston Martin DBS car barrel-roll stunt broke the world record for the most barrel rolls assisted by a cannon. Originally, the racing specifications of the DBS meant that a standard ramp would not be sufficient to get the car to roll, so the special effects team were called in to install an air-powered cannon behind the drivers seat. This allowed the car to complete seven full rolls. On November 5th 2006, after the film debuted, the stunt officially entered the Guinness Book of World Records. 7. 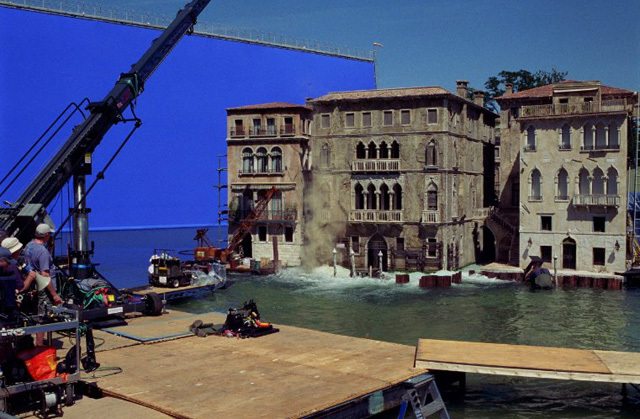 The sinking of the Venetian house at the climax of Casino Royale featured the largest rig ever built for a Bond film. For the scene involving Bond following Vesper into the house undergoing renovation supported by inflatable balloons, a tank was constructed at the 007 stage at Pinewood, consisting of a Venetian piazza and the interior of the three-story dilapidated house. The rig, weighing some 90 tons, incorporated electronics with hydraulic valves which were closely controlled by computer because of the dynamic movement within the system on its two axes. The same computer system also controlled the exterior model which the effects team built to one-third scale to film the building eventually collapsing into the Venetian canal. The model elevator within the rig could be immersed in 19 feet (5.8 m) of water, and used banks of compressors to strictly regulate movement. 8. Casino Royale includes a cameo by British entrepreneur Richard Branson, where he is seen being frisked at Miami International Airport. Branson's Virgin Atlantic rival, British Airways, took it upon themselves to edit Casino Royale for their in-flight version. This is a fairly common practice for movies that are screened on in-flight entertainment systems. However, the only cuts that British Airways deemed necessary for their in-flight version of Casino Royale was to entirely edit out Branson and remove a single shot of the Virgin Atlantic aircraft Branson supplied! Everything else remained. 9. 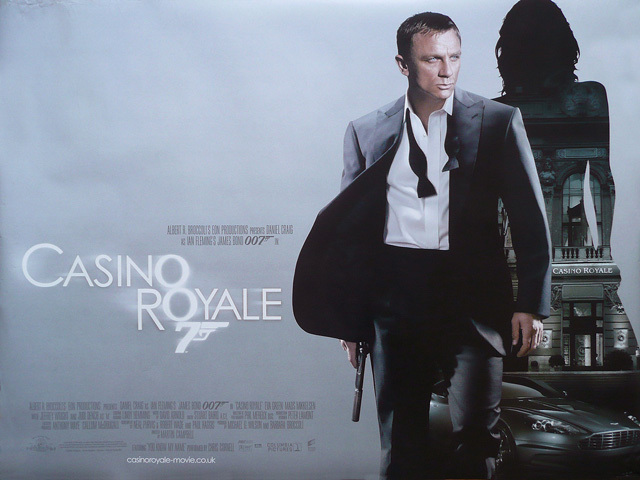 Even though throughout the production much of the negativity towards Daniel Craig continued in both the press and a variety of fansites, such was the demand for Casino Royale that when it premiered in London on November 14th 2006 it did so at the Odeon Leicester Square, the Odeon West End and the Empire simultaneously. Upon its UK nationwide release, Casino Royale broke series records on both opening day (£1.7 million) and opening weekend (£13,370,969), and at the end of its British box office run, the film had grossed £55.4 million, making it the most successful film of the year in the UK. Casino Royale went on to earn $599,045,960 worldwide, making it the highest-grossing instalment of the James Bond series until Skyfall surpassed it in November 2012. You don't fear death, and won't give into torture. You have Olympic level shooting skills. Even if you double-cross your own parents, you will never double-cross the organization. You have knowledge that would surprise even a scholar, and a sense of humor that would make even a bad girl grin. You have the sociability of a lamb, but remain a lone wolf. You have the highest level of experience with alcohol, gambling, cars and food.